We have been shortlisted for second award this month as the Surrey Advertiser announces the finalists for the Toast of Surrey Business Awards. 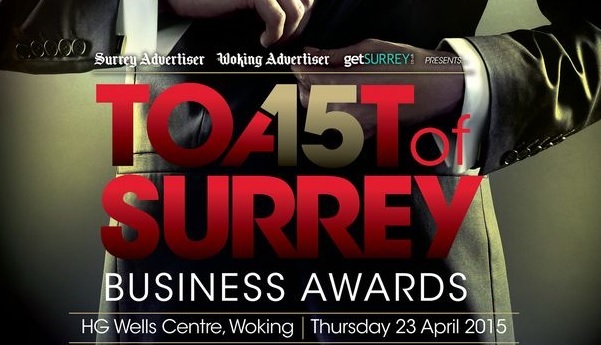 Sponsored by the Chamber of Commerce and run by the Surrey Advertiser, The Toast of Surrey Business Awards has delivered recognition to outstanding businesses across the county since 2009. We are delighted to have been shortlisted in this year’s awards in the ‘International Trade’ category. Group deputy editor of the Surrey Advertiser; Mark Miseldine said: “It was a very tough process but after a lot of hard deliberation, we managed to decide on a final shortlist. “Interest in the Toast of Surrey Awards increases each year and once again, the judges have been impressed with the calibre of the companies that entered. Well done to all the applicants. The awards ceremony will take place on Thursday 23rd April at the HG Wells Centre, Woking. We will keep you up to date on all the awards news.